The civilian government led by Aung San Suu Kyi allowed hate speech to thrive, destroyed documents and failed to protect minorities from crimes against humanity and war crimes by the army, a United Nations panel said on Monday. 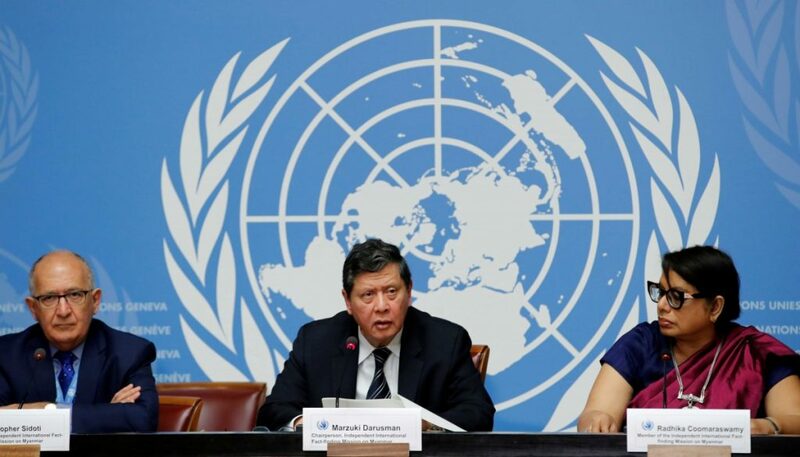 Geneva: Myanmar’s military carried out mass killings and gang rapes of Muslim Rohingya with “genocidal intent” and the commander-in-chief and five generals should be prosecuted for orchestrating the gravest crimes under law, United Nations investigators said on Monday. The civilian government led by Aung San Suu Kyi has allowed hate speech to thrive, destroyed documents and failed to protect minorities from crimes against humanity and war crimes by the army in Rakhine, Kachin and Shan states. In doing so, it “contributed to the commission of atrocity crimes”, the report said. The UN report said the military action, which included the scorching of villages, was “grossly disproportionate to actual security threats”. The UN defines genocide as acts meant to destroy a national, ethnic, racial or religious group in whole or in part. Such a designation is rare under international law, but has been used in countries including Bosnia and Sudan and in the Islamic State campaign against the Yazidi communities in Iraq and Syria. “The crimes in Rakhine State, and the manner in which they were perpetrated, are similar in nature, gravity and scope to those that have allowed genocidal intent to be established in other contexts,” said the UN Independent International Fact-Finding Mission on Myanmar. They also included Brigadier-General Aung Aung, commander of the 33rd Light Infantry Division, who oversaw operations in the coastal village of Inn Din where ten Rohingya captive boys and men were killed. The massacre was uncovered by two Reuters journalists – Wa Lone, 32, and Kyaw Soe Oo, 28 – who were arrested last December and are being tried on charges of violating the country’s Official Secrets Act. The court had been due to deliver its verdict on Monday, but at a brief hearing earlier the proceedings were postponed until September 3. In April, seven soldiers were sentenced to ten years in prison with hard labour for participating in the massacre. The report said Suu Kyi, a Nobel Peace Prize laureate, “has not used her de facto position as head of government, nor her moral authority, to stem or prevent the unfolding events, or seek alternative avenues to meet a responsibility to protect the civilian population”. The top UN human rights official Zeid Ra’ad al-Hussein has called the crackdown against the Rohingya a “textbook example of ethnic cleansing”. Suu Kyi’s government has rejected most allegations of atrocities made against the security forces by refugees. It has built transit centres to receive Rohingya returnees to western Rakhine state, but UN aid agencies say that it is not yet safe for them to return. The Security Council should “adopt targeted individual sanctions, including travel bans and asset freezes, against those who appear most responsible for serious crimes under international law” and impose an arms embargo on Myanmar, they said. The four other generals that should be prosecuted were named as the army deputy commander-in-chief, Vice Senior-General Soe Win; the commander of the Bureau of Special Operations-3, Lieutenant-General Aung Kyaw Zaw; the commander of Western Regional Military Command, Major-General Maung Maung Soe; and the commander of 99th Light Infantry Division, Brigadier-General Than Oo. “The Tatmadaw acts with complete impunity and has never been held accountable. Its standard response is to deny, dismiss and obstruct,” the UN report said. The report also criticised Facebook’s response to allegations, by members of the same UN panel in March, that the social media giant had been used to incite violence and hatred against the Rohingyas. Facebook said in a statement issued ten days ago following a Reuters investigative report into its failure to combat hate speech against the Rohingya and other Muslims that it had been “too slow” to address the problem in Myanmar and was acting to remedy the situation by hiring more Burmese speakers and investing in technology to identify problematic content.